Where in the world is Matt and how can he record from his mobile location? Hear his HTC TyTN review and our answers to your e-mails and voicemails! MoTR 65 isÂ 38:11 minutes long and is aÂ 35 MB file in MP3 format. Exclusive interview with Sasquatch as Matt’s “on location”. Wait…the guest didn’t show! Matt reviews the HTC TyTN and it’s jam-packed with functionality. James is considering the new Palm GPS solution. E-mail from Nick: when to use a Tablet PC vs. when to use the UPMC? Voicemail from Matt: MemMaid helps with memory management in Windows Mobile. Any car mount suggestions for an HP tc1100? James recommends a check of Arkon. First Dell batteries and now Apple batteries get recalled. If Apple made a Tablet, what would that do for the overall Tablet PC market? Matt’s away but that doesn’t stop Kevin and James from saying Ubuntu a record number of times in 30 minutes! MoTR 64 is 31:29 minutes long and is a 28.8 MB file in MP3 format. Congrats to Father Roderick and the Catholic Insider podcast! Kevin took the Ubuntu plunge (with a safety net) on the Samsung Q1. Even scarier: how did GottaBeMobile know to write that story up at the VERY minute we were recording this segment of the show? ooohhh….scary…. Need another input method for your UMPC or Tablet PC? James tried out InScribe which is coming very soon from Ilium! If you have a touchscreen computer, you will want to check it out. Linda Epstein provides a great analysis of why UMPCs aren’t $500…makes sense to us! Dell recall of the Sony notebook battery. Yes, Sony makes the Dell battery…interesting…. Freeware of the show: GAIM instant messenger client for multi-IM platforms. Linux really IS gaining smartphone market share; just ask Motorola! Thoughts on the Vega UMPC, a way to use OneNote Mobile at Home Depot, game controllers doubling at keyboards and mice, plus our freeware of the show! MoTR 63 is 35:03 minutes long and is a 32.1 MB file in MP3 format. Vega UMPC news and thoughts. Did you have your boss run the Nokia Convince-O-Matic program? Three-in-one hard drive enclosure supports up to a 750 GB drive, includes a memory card reader, and doubles as a USB hub! Freeware of the show: Notebook Hardware Control’s latest version. Great for mobile computing devices for understanding your hardware specs and power usage! Can you improve the one-handedness of a handheld device? Use OneNote Mobile, a Windows Mobile phone and a UMPC for your next home project! Find out how to use a USB game controller as a mouse AND a keyboard. MoTR 60 is 37:00 minutes long and is a 12.7 MB file in MP3 format. Kevin’s not here and we’re lost without him! Blame me for the inferior audio quality but I can’t duplicate the awesome quality that Kevin produces. Vote for us for Best Mobile Podcast every day for the Podcast Awards. Mobile Tech Manor is moving and it’s a lot easier with mobile tech. TabletKiosk announces two new UMPCs! Matt likes his BatteryGeek PortablePowerStation. Get a copy of either Evernote Plus or ritePen for free! Treos, Treos everywhere. Matt misses his Treo. Sprint joins Verizon in announcing EV-DO Rev. A this year. Super high speed wirelessly! Motorola Q comes to Sprint in Q4. Freeware of the show- WamPad, mobile portal extrordaniere. More mobile technology, some listener voicemails, freeware of the show and what Microsoft needs to know for Zune to be successful! 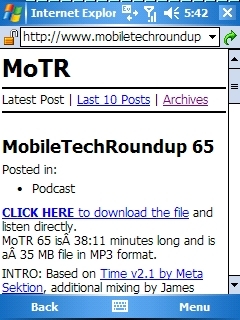 MoTR 60 is 35:16 minutes long and is a 32.4 MB file in MP3 format. Here comes the judge! It’s time for the annual Smartphone & Pocket PC Magazine Best Software Awards. Zune, Zune, Zune: what does Microsoft have to do to make this successful and what is it all about? Follow along the Zune-scape with ZuneThoughts, which is coming soon! T-Mobile updates the MDA ROM with some radio issue fixes and the all-important A2DP Bluetooth stereo profile. James and Matt spend Kevin’s money on a Bluetooth headset to test A2DP. Could it be this one from Sony that we eye-spied on the FCC site? What’s up with phones that can seamlessly roam between cellular and WiFi? Is the general public ready? Are the networks ready?!? Listener VM from Matt: Any Q1 case suggestions? How about webcams? Freeware of the show: map4pda lets you work with Google Maps on your Windows Mobile 5.0 device. Hey, it works with Yahoo! Maps, Ask.com and Virtual Earth too!